Later on in the telecast, they handed out the award for Best Actress. In what proved to be a real surprise, the award went to French actress, the cute and adorable Marion Cotillard. The role she won for was that of legendary chanteuse, Edith Piaf, in the film, "La Vie en Rose". This was one of my favourite films last year and I was so happy for Marion, who seemed to be as shocked by her win as anyone when she delivered an emotional acceptance speech in her cute and adorable French accented, broken English. Prior to seeing her on the Academy Awards last night, I had not actually seen what Marion Cotillard really looked like, as she is practically unrecognizable as the poor wretched "Little Sparrow", Edith Piaf, who, despite her massive talent, was frankly not exactly that cute and adorable herself. (No wonder the film's makeup artist also won an Oscar last night.) Anyway, here is Marion Cotillard's acceptance speech. And yes, she's not merely cute and adorable - she's GORGEOUS!! Addendum: It appears that all three of those videos have now been pulled. I wonder if it was AMPAS or Disney's decision? I did this sketch a couple weeks ago from the last debate between Barack Obama and Hillary Clinton on CNN. It seems everybody's running on a message of "Change", but with good reason: after eight long years of enduring George W. Bush, not just America, but the whole world could use some! 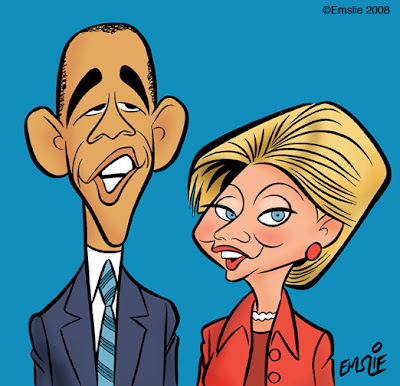 The majority of we Canadians have historically always favoured the American Democrats, so it should come as no surprise that I'm hoping to see either Barack or Hillary in the White House come next year. I personally prefer Barack Obama, as I remember seeing him interviewed a couple years ago on PBS' Charlie Rose show and he struck me as a guy with intelligence and integrity. Seeing him in the debates, he seems to be less biting in his attacks towards his opponent, as if that sort of mudslinging makes him uncomfortable. I like Hillary Clinton too, but I do have some reservations about her as she has been rather ruthless in her attacks on Obama. But that's just the nature of the game of politics and I'd be happy with either one of them as President. I figure no matter which one wins, that they'll surround themselves with wise counsel to keep them in check. Actually, things are shaping up pretty good on the Republican side this time around too. It looks like the majority of Republicans have smartened up since eight years ago, and are now backing the more moderate and honourable John McCain. Fact is, I think they should have made him their man back in 2000, as many Democrats would have found him worthy of their vote too, being a straight up kind of guy who doesn't blindly toe the party line. Had McCain been president, I doubt that America would ever have ended up in the Iraq quagmire we have today. In short, I think this is an exciting Presidential race with the top three contenders all being worthy candidates for the job. I hope Americans realize just how lucky they are in their choices leading up to the November election.